Play-Doh enlightens circular permutation for H2 math tuition students. There are some who cannot understand (see) why we need to divide our answer by 2 when we are threading colored beads in a ring! Typically, the question goes like this: How many ways can 5 different colored beads be threaded around a ring? The solution is simple, if we were to arrange the 5 colored beads in a circle on a table, the answer would have been (5-1)!=4!=24. Everyone understands and agrees with this. However, because we're threading them in a ring, which we can hold up and "flip", it is reversible, we need to divide 24 by 2 otherwise, we will be double counting! And therefore, the correct answer should be 24/2=12. Here comes the trouble! Why must we divide it by 2?? 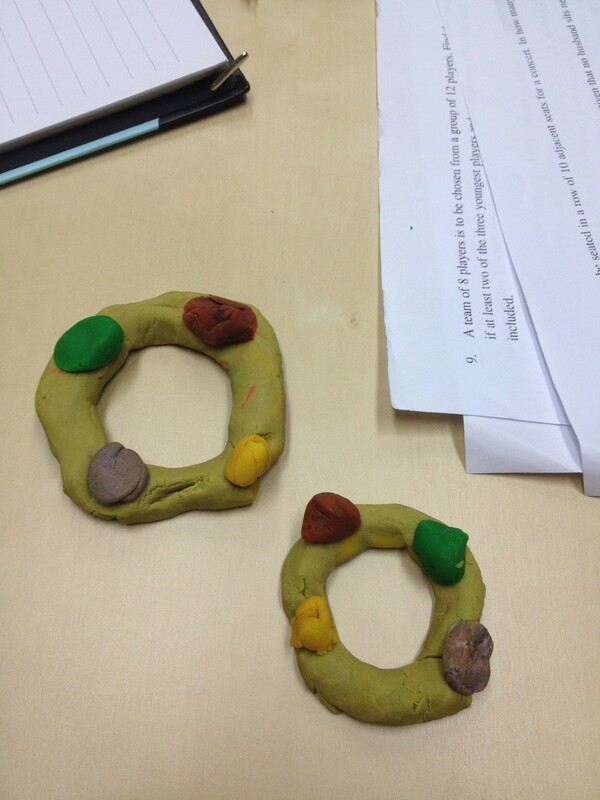 Simple Play-Doh becomes a great tool to explain circular permutation. Never thought one of my daughter's favorite toys can become such a useful teaching tool! Of course, everyone understands how the "flipping" of the ring necessitate the dividing by 2!